Wilson Hill Carpentry is located 7 miles north of Shelburne Falls in Colrain, MA, 2 miles south of the Vermont border. Owner Scott Barrows fell in love with timber framing while exploring 19th century barns as a boy in northwest Connecticut. After receiving a B.A. in Natural History from Colorado College and a M.A. 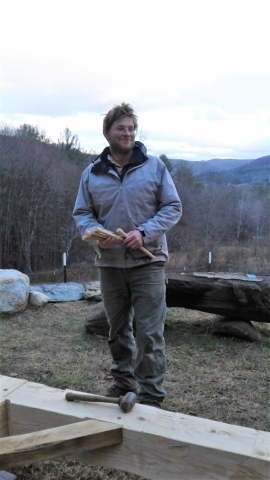 in U.S. History from James Madison University in Virginia, Scott returned to New England to pursue his passion for history, building, and homesteading. He has 17 years of carpentry experience. Wilson Hill Carpentry is fully licensed and insured, and is a member of the Timber Framers’ Guild and the Greater Shelburne Falls Area Business Association.